My Sunday was pretty awesome. Late afternoon I was lucky enough to meet up with Veronica Darling while she was in San Luis Obispo. She stayed at Madonna Inn with her family and I got to meet them all! Veronica is just what you would expect, she is bubbly, friendly, and beautiful! As cliche as it sounds, when I met her I felt like I had known her a long time. She has a certain warmth about her and you can't help but want to be her best friend. Seriously! I am trying to convince them to move to California! After meeting Veronica I raced home to try and vacuum up the cat hair all over my house before my good friends Jessi and Curtis came over for a double date to see The Great Gatsby. I have heard a lot of negative reviews about the movie, but in the end I really liked it! It was not authentic 20s, but I didn't go in expecting it to be. Come on, if Jay Z is on the soundtrack do you really think that it's going to be 100% authentic? The actors were great, the story stayed fairly true to the book (of course there were some movie adaptations), and the costumes, colors, and backgrounds were all so beautiful. A true feast for the eyes! I would like to see it again in 3D! Have any of you seen the movie? What did you think? I am looking forward to seeing Gatsby, too. I just love how Baz Luhrman puts his own twist on classics! did they decorate that room JUST for you two?! i love that shot!!! After watching it I really regretted not seeing it in 3D! Those party scenes must have been so amazing to watch! Actually, kind of! hahaah We were sitting at the table and it didn't have a tablecloth. One of the ladies working insisted on putting one on for our pictures :) But PINK is the color at Madonna Inn. EVERYTHING is pink! Which is why I wore the dress I did. 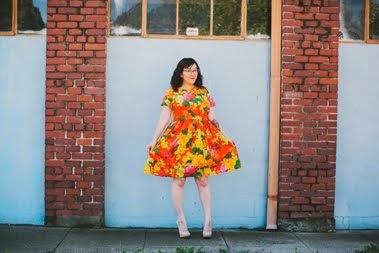 I made the dress for one of my best friend's wedding which was also at Madonna Inn. I agree - After seeing it, I think the reviews were a bit harsh. The set and costumes were amazing and I thought DiCaprio was fantastic as Gatsby. He beat out Redford for me! I have not seen the movie yet! I also read the negative reviews of it, and am planning to go on June 1st with some folks from a sewing group I belong to. I was happy to hear you enjoyed it, as I didn't want it to be an excruciatingly painful 2 hours!! I have the pattern and fabric picked out for my Great Gatsby Sewing Challenge! I saw it and enjoyed it enough. I too was not expecting authenticity but with what was authentic i liked it. I like how he really dove into Gatsby's character- his love stricken side, that the 1974 version didn't emphasize as much. I hope everyone sees it, either in theater or on video, and make up their own mind about it. Clearly the book is a classic for a reason and any movie adaptation will fall short in some way or another. Hi Erin, I just found your blog via Colette Patterns. I love your sewing creations! I wish I had known you did a Gatsby sewing challenge- I've been thinking of trying a 20's style dress for a while now but I've never had an occasion for it. Also, I think we're neighbors! (I saw your Madonna Inn pic and did a double take) I grew up in Arroyo Grande and now live in Santa Maria. Small world!